WTF Are You Reading? 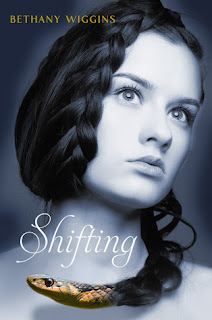 : You'll Love the Changs in "Shifting"
After bouncing from foster home to foster home, Magdalene Mae is transferred to what should be her last foster home in the tiny town of Silver City, New Mexico. Now that she's eighteen and has only a year left in high school, she's determined to stay out of trouble and just be normal. Maggie Mae is a girl that you can't help but love. Your heart goes out to her from the start and you spend the entire book praying that she will find the happiness and acceptance that she deserves. When she seems to start doing just that after being taken in by Mrs. Carpenter, her foster mother, whom she trusts enough to reveal the secret of her shifting nature; you just want to stand up and cheer. More focus was placed on the two of them making half-hearted attempts to be "friends" than on her shifting. This game of emotional cat and mouse,coupled with his uncanny ability to "feel Maggie's emotions" and always be there when she needs him, really makes one want to know just what the deal is with Mr. O'Connell. The attention to detail that went into the Native American spiritualism that serves as the basis for this tale is second to none. This is in fact one of the saving graces of this book at many points where there is a lull in the action or the loves me/loves me not that is Maggie and Bridger get tedious. What really makes this story however, is the ending and the ten or so chapters that lead you there. This is where the majority of the story's questions get answered, mysteries get solved, and th sweet bow that makes the "pretty ending" is tied nice and tight. The thing that makes the end of this book so special s that it is timely. There is no rush. Yes, the action does speed up a bit, but not in a forced way. What happens is just a natural progression. This is a fun stand alone read that will definitely leave you happy at it's ending.